KH tried to correct the bug of the initial boxing in later boxing. It's funny that the fix wasn't revealed though... not convenient to apply ? still not accurate ? it's better not to recognize the error ? don't talk about it because people who bought 80115 will ask for a replacement sprue ? simply forgotten ? Anyway I think it's nice from KH to have attempted to improve the accuracy of their kit. Also worth noting is that extra parts exist even in F-101B boxing (where they are not needed, but they can be used for the F-101A/C boxing where they are not present). I assume they modified the 80115 tooling so it's normal the new parts come with any kit. I noticed the new parts, looking like toenail snippings, in the B boxes. Looking at photos and rivet line counting (guilty, this time!) it appears the most accurate method is to add the new parts after cutting the edge off the inlets, at exactly the same angle, at a depth slightly less than the inside narrower width of the add-ons. Any one discover a drop-in replacement louvre vent somewhere? Or just file back a small amount. The parts are in my own copy of the RF-101C. Here is the final draft of the first RF-101C sheet. Keep in mind that the Voodoo is a large aircraft and the full-tail markings take up a lot of space. Add to this the poor common stencilling on the kit sheet that needs to be completely replaced; and it looks like I will be able to fit at most two natural metal and two camouflaged aircraft on one sheet. I will release a second sheet only if the first one sells well - if it happens, the second sheet will follow the same formula. 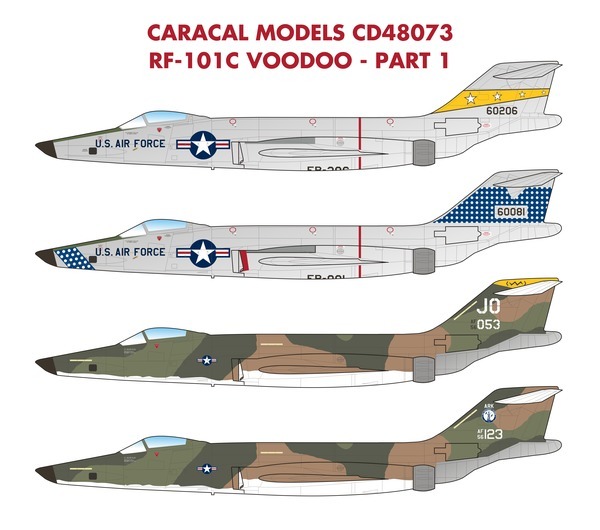 Profiles coming soon - but all four options already exist on my 1/72 scale RF-101C sheet (CD72047) so you should have an idea. I am glad I took the time to ensure that the markings fit the Kitty Hawk kit: many of the design elements needed tweaking for a good fit. There is a second sheet (not shown) with the large US national insignia and USAF markings needed for the natural metal options - it is the same sheet included with my earlier F-101A/C set (CD48052 - link). I'm doing the Canadian B version in white. KH quotes USN White. Is this correct or should it be a more brilliant white? 1/48 RF-101C kit by Kitty Hawk. end and achives a smoother joint between its contours and general lines of the fuselage. RF forward fuselage of the real plane was virtually a continuation of the general fuselage lines, but the nose parts of the kit have appeared in a compleltey different way, and it looks like a part from a different plane. This issue is illustrated at the picture below. Our new, replacement nose was created in accordance with actual dimensions of the real aircraft, it appears to be more narrow at the front end and achives a smoother joint between its contours and general lines of the fuselage. Looks like a nice detail set into the bargain, but I'm going to hold fire and see what, if anything, emerges from the likes of Aires and CMK. The Dmold stuff does look irresistible - just hurts having to get two sets at a time when Eduard are coming out with a big wave of extras, some of which will be required acquisitions. DMold has very fine yet sturdy castings. I have several of their correction sets including the F7F-3N nose. As thin as the original plastic. Sounds good, except that the Kitty Hawk ventral clear part (which includes both the rear two lower windows) is far too shallow even for the kit parts, so I am not certain whether the DMold kit will solve this. Major boo-boo by Kitty Hawk. But hey, it's an RF-101C. Maybe Aires Quickboost can fix it? LOL. Most Czech stuff only adds detail instead of fixing anything. This one will have more Vietnam options with nose art ("Gerry's Clown", "Luv Bug" and "The Iron Eyeball") , two very colorful silver jets as well as an overall ADC gray example. There is another (not shown) with the large US national insignia and USAF markings needed for the natural metal options - it is the same sheet included with my earlier F-101A/C set (CD48052). Still no louvres for the Recce C or right rear upper flank of all variants. May have to design some decals if Aires don't step in. The Eduard is even nicer than in the pictures - the instruments have little lenses printed over them, for shiny dials. Yes Tony, that's an improvement over their discontinued F-101A/C interior S.A. set. I got all these full PE sets for all the three Kitty Hawk's boxings and I hope that all will looks great. Still waiting for Aires to do some bits. Same here. Four lots for two RF-101Cs and two F-101Bs. Shaved a little off the bill for the recces by getting the zoom placards, but needed full interior sets for the interceptors. Wiped out my entire winter budget by the time I got three Caracal Voodoo sheets and one set of the D Mold nose parts — all very nice too. And still waiting for replacement venting, particularly the ventral pair missing on the RF-101C kit. Skipped on the exterior sets as Eduard omitted these features. Time to get a head of steam on the Corel Draw boiler me thinks, as Aires have seemingly bypassed these kits (so far, anyway). I wish they would stop poncing around with a zillion different etch sets, and produce a proper shaped canopy! With the popularity of the recce bird, you would think someone would bite the bullet, but nobody wants to know. It's the same as the fighter, and the 2 holer screen is the same. The rear canopy is similarly mis-shapen. Can no-one produce 3 pieces of clear styrene or vac-form? Same with the decals here, too! Three decal sheets from Caracal for the interceptor, two-seater and recce birds. Decided to order the DMold nose yesterday, but an item is out of stock, unfortunately. And﻿ still waiting for replacement venting, particularly the ventral pair missing on the RF-101C kit. I thought about it and there are some 1:72 vents from the Hind PE set that fits well. Anyway, it’s only for some airframes and not necessary addition. C﻿﻿an﻿ no-one produce 3 pieces of clear styrene or vac-form? I hoped that the DMold produce it along with the proper IP shroud with their nose kit - just a three details to add - not a big deal for the manufacturing, I think. Even if it will be priced up to $30-35, it will be a great deal!